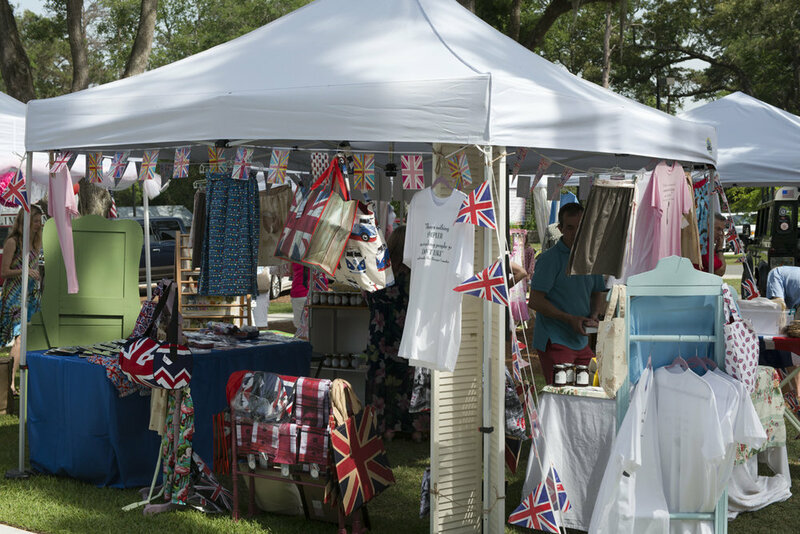 The English Fayre will be quite the festive day on May 4th, 2019 as we celebrate “All Things British”. ‘Tis a community affayre hosted by St. Peter’s Anglican Cathedral, designed to share the experience of gracious hospitality, merriment, and much entertainment for all ages. The lawns and church will be filled with visitors from all over, merchants overflowing with wares and treasures, grounds to be toured, and doors opened with welcome. The lane of Shoppes will be a shopping experience with a uniquely English atmosphere. Gifts and merchandise will be found in the merchants’ Shoppes. Suggestions: Items for children, men, British goods, and your special, unique treasures. Your merchandise descriptions will assist us in promoting your Shoppe (and honor merchandise categories). The English Country Market will be more the farmer’s market with breads, cakes, pies, and sweets in “The Great British Bake Shoppe”. The English Fayre promotion includes social media, print, signage, website, and digital media. Please provide pictures and descriptions of your merchandise along with your logo. The 2018 English Fayre will be held May 4, 2019. Location: St. Peter’s Anglican Cathedral – 4784 Thomasville, Tallahassee, FL 32309. Each merchant booth space is 10’ x 10’ and the cost for each space is $50. The English Fayre is open to merchants on a space available, first-come, first-serve basis. St. Peter’s English Fayre has the discretion to assign booth spaces. Booth setup on Friday, May 3, 2018. All booths must be in place by 8:30 am on Saturday, May 4, 2019. Merchants must have a white tent. Merchant booth and ALL goods must stay in place until the end of the Market at 3:00 pm on May 4, 2019. (Violation of this rule will result in a merchant not being re-admitted to future events). Booths must be open and staffed during all Fayre hours (9:30 am-3:00 pm). Merchant will provide pictures and descriptions of your merchandise for promotion. Merchants will comply with all instructions by law enforcement in charge and employees of The English Fayre. Items for sale must be contained within the assigned booth space or in such a manner as to not cause a hazard or nuisance to other merchants or the public. Merchants will pack their tent and booth items before bringing their vehicle into the venue area. All items will be removed by 5:30 pm on Saturday, May 4, 2019. There is no smoking on the premises where The English Fayre is held. Payment is required at the time of the application. Merchant agrees to maintain the dignity and integrity of the Fayre. St. Peter’s Anglican Church may terminate all Merchant’s rights at any time and Merchant to leave the Church Property immediately. Merchant agrees that the application fee is non-refundable once accepted to the St. Peter’s Anglican Church English Fayre. Merchant shall indemnify and hold St. Peter’s Anglican Church harmless (including attorneys' fees) from liability, responsibility or damages of any nature caused by any claim, action, suit or case associated with or related to Merchant or claiming through Merchant in any way. This agreement constitutes the entire contract between parties, and no charges shall be valid unless agreed to by both parties in writing. The Beatles are back! The Beatles are playing our favorite hits! Castles are emerging on the scene, and a new “Fab” backdrop for the stage. Digital billboards will be rotating in four locations beginning April 12. It will be quite the English Garden Tea! Fit for a Queen! The Best English Accent Contest and Wellie Wangin’ continues…and lots of new children’s activities. Cross Keys Pub is always a favorite stop for adults with St. Peter’s Ale shipped from England with house English Pimm’s Cup.